loving all of the colors! 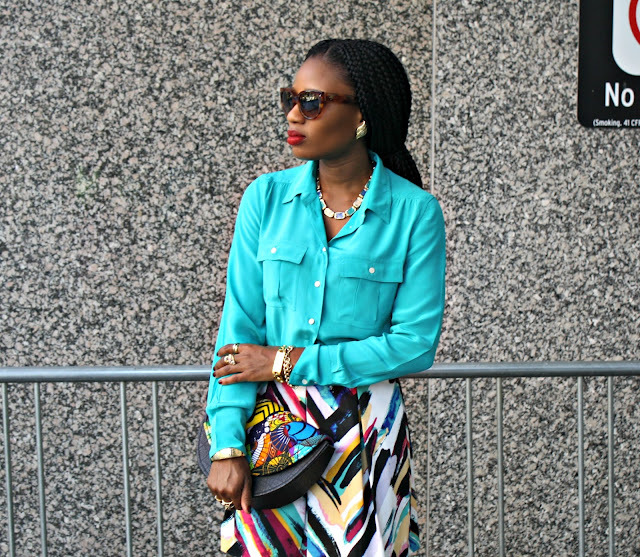 I love both looks but that printed skirt with the turquoise top and the zara heels A-mazing!!! Im in love you girls rock! 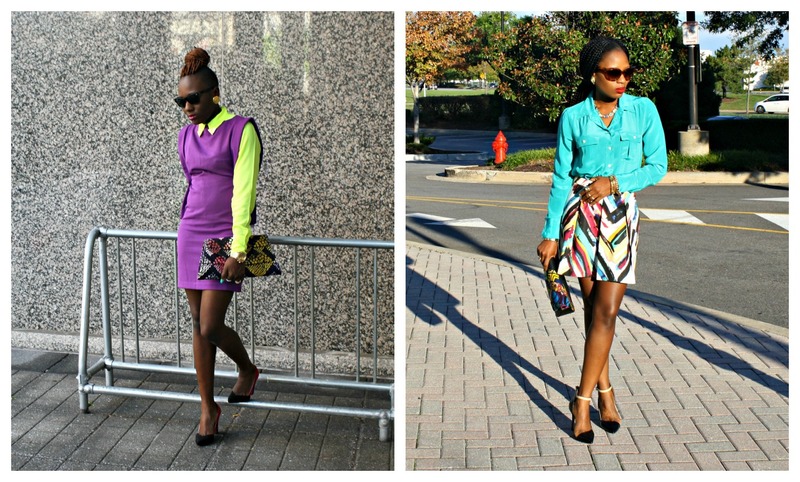 These are some fab transition looks! The colors pop and you ladies look awesome! These looks are so amazing! Love the bright yellow and purple together! 5th & 6th - you guys keep nailing it. LOVE all the vibrant colors of this set! And those purses! Where did you get such great purses? I love the purple/neon combo. Never thought of mixing these colors, but it looks awesome! Oooooooh that purple and yellow is fabulous!!! I love the metal tips on the collar! I love how the collared shirts have such different vibes in both outfits, love!!!! Amazing skirt and I love that gorgeous dress! You both look great and the accessoiries are gorgeous. I think these are my favorite outfits by you both so far! I just love the colors. The blue and that skirt is just gorgeous. And the purple dress with the yellow underneath is amazing. Love! i really like your outfits u girls have a lot of style! adore your blog, love the details here ladies. I love the H&M Skirt! you both look stunning - love the bright colored blouses!! I love that you girls always use bright colors! Love the skirt! oh wow how gorgeous you both are! Very pretty. I love the clutches. I love that skirt Bisola is wearing, and I am wondering if you picked up the pants too :) Dammie's purple dress is awesome, I love Aqua designs. Love how you ladies wear colour, so pretty! The lime and purple just pop and the skirt is gorgeous. That printed skirt is to DIE for! i almost bought that skirt too! I love that pattern that H&M has, I want a pair of pants like your skirt. Both gorgeous as usual but today I rather choose the miniskirt with the turquoise top!! 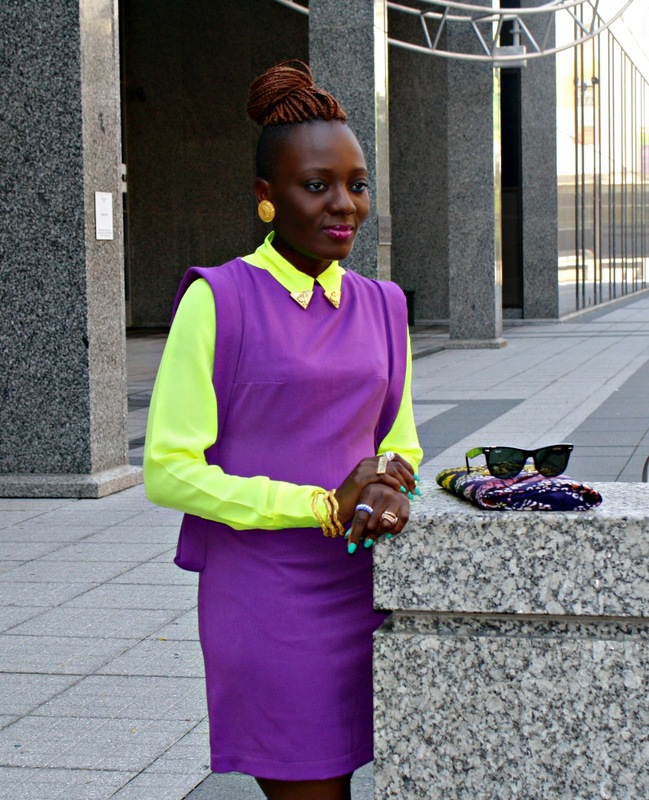 Great look, love the neon with the purple dress and i love the colourful skirt. Check out my new blog interview, i would love to have your feedback. wow!!! love your skirt and aqua dreess so much!! yellow and violet combination is incredible!! you ladies look amazing, i can never pick a favorite! I love both of these outfits! The vibrant colours (and colour contrasts) and accessories are amazing! You both wear these clothes so well. Thanks for the kind words on my blog earlier- just started following you! I like the retro vibes! A friend made it for us!